With the recent unveiling of the stars still settling in the minds of gourmands, now, hell-bent on seeking out the $2 Michelin-starred Hong Kong Soya Sauce Chicken Rice hawker in Chinatown's Smith Street; I'm glad to profess that my virgin experience with dining at Michelin starred establishments have risen from a balmy zero to a credible 14 joints miraculously over the span of a few hours at the heart-stopping, enthralling gala dinner held at Resort World's Sentosa. 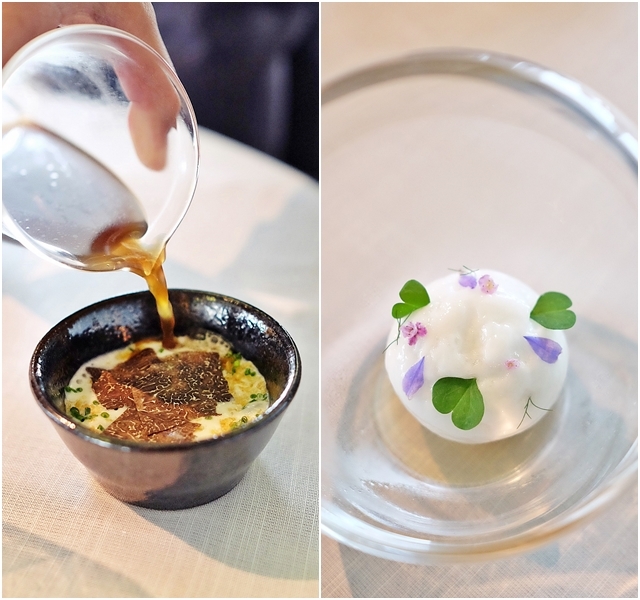 My most recent endeavour being lunch at JAAN where Chef Kirk Westaway's newest spring creations reflect a sense of positivity, almost akin to a spring in his step, grounded by traditional tastes linking back to his childhood spent in the UK. The critics have waddled in gradually even after Chef Julien Royer's departure from the plush pads in 2015, leaving his sous-chef to fill his shoes. By then, Chef Kirk Westaway had already achieved some form of stardom, cooking nine other chefs in S.E. Asia under the table before embarking on a similar challenge around Europe; hence, it is easy to say that the progression of taking the reigns was a natural move; albeit a challenging one for most extreme foodies to accept. Still, over the course of the year, foundations had been laid and Chef Kirk had slowly found his voice in the kitchen. The following elaborate lunch set-up, a representation of the genius mind and his inspirations. We ate well, the dishes right down from the starter snacks to the desserts benefiting from the use of marvellous ingredients prodded into near perfection with a little imagination and prodigal use of butter. Fish and Chips consumed in a single petite bite nestled in a crispy potato nest. Then there's Mediterranean inspired Tapoica chips with hummus, cumin, yoghurt, olives and chervil as well as the refreshing Filo Pastry with Herb Salad and Creme Fraiche for that bit of unfussy brightness. There was also a oleaginous filling of truffle and foie gras mousse between crispy macaron shells - an odd idea and a good one. The Amuse Bouche was delicious in ways I rarely experienced, even in the first course of more price elaborate restaurants. Very gently salted aerated Charlotte Potato Espuma went with a truffle bouillon, shiitake mushrooms and potato gravel grounding the flouncy teaser. The next course again enthralls with a seamlessly flawless fusion of Thai styled flavors with refined French techniques. The Dressed Crab reveals a cloud-like cauliflower dome giving way richer innards of Australian spanner crab dressed in Thai-style golden curry percolated with a tidy amount of Oscietra caviar. Fans of asparagus will revel in the next dish. Pertuis Asparagus - the treat done three ways; char-grilled, blanched and shaved on a mandolin. The standout portion of the dish being the lone ranger, white asparagus spear decked out with a moreish parmesan-garlic crumb on one end. Finished with Joselito ham, morel mushrooms and topped with Champagne sabayon, there are dozen ways to consume this pretty plate; but at the end of the day, it gets polished off, in a jiffy. I highly recommend the next dish. Looking squeamishly like a pile of greens on a plate, this dish defies all odds and comes out top with its delicate configuration of Confit Brittany Cod with amalfi lemon gremolata. Fresh baby squid and cordifole roam the plate with military precision while the squid ink salsify tuille provides an earthy crunch to weigh down the ethereal lightness of the spa-like dish. With a generous christening of creamy fish veloute, I knew for sure that the Michelin stars were in sight. In one dish, the Cannon of Lamb, Tasmanian saddle of lamb is splashed with a ridiculously bovril-like rich lamb jus that's coaxed back from the brink of over-indulgence by braised baby gem lettuce and pickled onions, and an inspired touch, smidgens of potato-based bagna cauda. The lamb saddle is rolled in herbs and spices and wrapped in its own fat trimmings before being sous vide for 5 hours. The immaculate circles of red paired with a savoury lamb belly croquette and lamb roulade. Terribly therapeutic despite my usual aversion to lamb dishes when dining in at restaurants. There's no drink that the British like to guzzle more than pimms. Hence, the clever move to present Pre dessert of Pimm's Cup to set the re-inspired old world tone. Bittersweet sacs of pomelo infused with Pimm's No. 1 is topped with a big white puffs of orange-lime espuma, and topped with a neat quenelle of cucumber sorbet. Cucumbers, orange and julienned fresh mint complete the pretty picture making for a rather refreshing palate cleanser after the heavyweight that was the lamb dish. Dessert followed swiftly. The Gariguette Strawberry definitely scoring a place in my books as being one of the most perfect desserts. French gariguette strawberries waltz alongside pineapple strawberries which sit snugly on vanilla creme patisserie. The little mounds of vanilla parfait - sponge and smooth cream achieving transcendence even on its own. Spiced sorbet inflicted with touches of cloves, cinnamon, bay leaves, star anise and cardamon in the most genial sort of manner grounds the dish while the crystal clear ruby red strawberry consomme ties everything together. 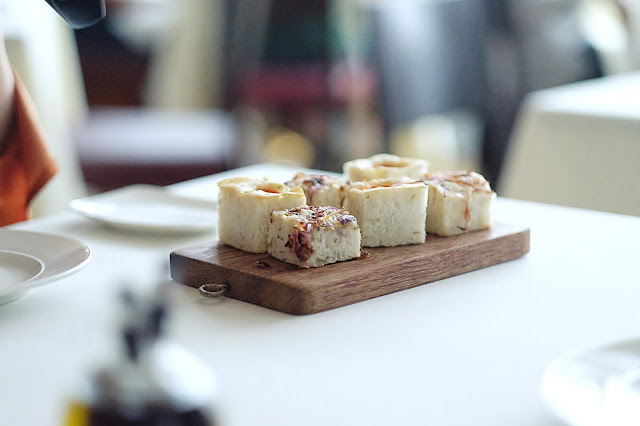 Once again, congratulations to Chef Kirk Westaway and his team at JAAN for the 1-star win at the Michelin Guide 2016. Well deserved indeed.